As always, the highlights of the weekend were authors’ readings showcasing a variety of styles and talents. In today’s dispatch, Asymptote’s Editor-at-Large for Slovakia, Julia Sherwood, reports on the high points of the European Literature Days festival, which she attended in Spitz, Austria from November 22-25. This year’s festival, whose theme was “film and literature,” featured many of Europe’s best film directors and screenwriters alongside high-profile novelists and essayists. What is the relationship between film and literature? How does narrative work in these two art forms and what is lost or gained when a story is transposed from paper to the screen? These questions were pondered during the tenth European Literature Days festival, amidst the rolling hills on the banks of the Danube shrouded in autumn mists, on the last weekend of November. 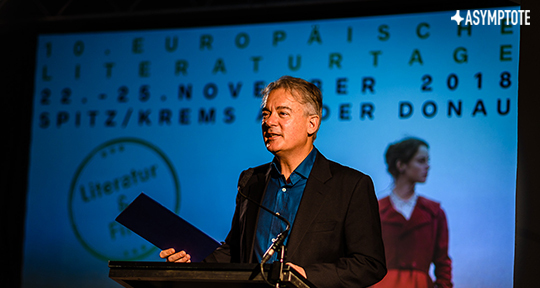 As in previous years, the weekend was full of discoveries, with the tiny wine-making town of Spitz and venues in the only slightly larger town of Krems attracting some of the most exciting European authors, this time alongside some outstanding filmmakers. 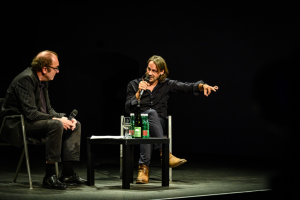 Robert Menasse and Richard David Precht. Image credit: Sascha Osaka.